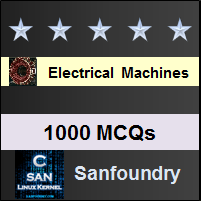 This set of Electrical Machines Multiple Choice Questions & Answers (MCQs) focuses on “Induction Generator”. Explanation: For the same machine if the slip is made negative by raising the speed above synchronous speed. Explanation: Induction generator needs the continuous flux and it can be either provided by the bus or the synchronous generator. Explanation: To provide the lagging reactive power, it is must that it should be have a source of lagging reactive power. Explanation: It must be connected to capacitors which can be the source for lagging reactive power. Explanation: The voltage build up process of the induction generator is similar to that of the dc shunt generator. a) it will not run. Explanation: If the residual flux of the isolated induction generator is not present, then voltage build up will not take place. Explanation: Voltage build up will depend on capacitance and the residual magnetism of the rotor iron. 8. I. Voltage of an externally excited induction generator can not be controlled. II. Frequency of an externally excited induction generator can be controlled. Explanation: Voltage and frequency of the externally excited induction generator can not be controlled, because they run in parallel with the existing 3-phase systems. 9. What is/are the shortcomings of an induction generator in real time system? Explanation: All are the disadvantages of an induction generator. 10. Induction generator is self excited machine. Explanation: No, induction machine is first run as motor and then as generator. So it needs the current to set up the flux continuously. 11. Induction generator can only work at leading reactive power. Explanation: Because it can not supply any lagging power factor. 12. Choose the correct match for the corresponding characteristics of a 3-phase induction motor. Explanation: Speed will remain constant for a fair amount of operating range. Torque will be linear in small slip regions. Explanation: Induction generator is widely acceptable in low speed and low power operation like wind power systems. 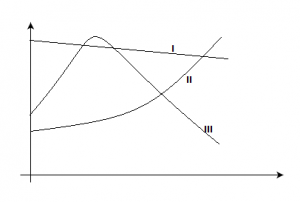 Explanation: For the slip more than 40%, the efficiency reduces more than 50% for an induction motor. 15. Two three phase squirrel-cage induction generator are identical in all respects except the fact that the slot depths in machine B is more than that of A. Explanation: As the slot depth in machine B is more than that of A, B will have higher reactance as the leakage flux will be lesser.